Success: The Ultimate Guide to College, Career, and Personal Excellence sparks the reader's intrinsic motivation to unleash their full potential by implementing research based strategies in metacognition, effective communication, goal setting, time management, growth mindset, wellness, stress reduction, and emotional intelligence. Cultivates a college culture that promotes student persistence, retention, and degree completion. Empowers students with strategies to maximize their college experience, graduate, attain their ideal career, and create the life they desire. Develops student’s psychological investment in learning, ultimately increasing his/her willingness and desire to learn and maximize their effort. Creates positive sustainable changes in the lives of students. Is easy to adopt! A myriad of instructor resources (PowerPoint©/Prezi© presentations, test banks, BlackBoard© shells, and more) paired with an author on-call for content implementation and teaching-related questions, make the transition virtually seamless. Is practical! Call for Action vignettes in each chapter encourage students to write out purposeful actions to implement strategies into their own lives. Sara Adams Centeno (@PassionateProf_) is an innovative educational leader with a proven ability to maximize learning opportunities and raise student achievement outcomes in diverse higher education settings. 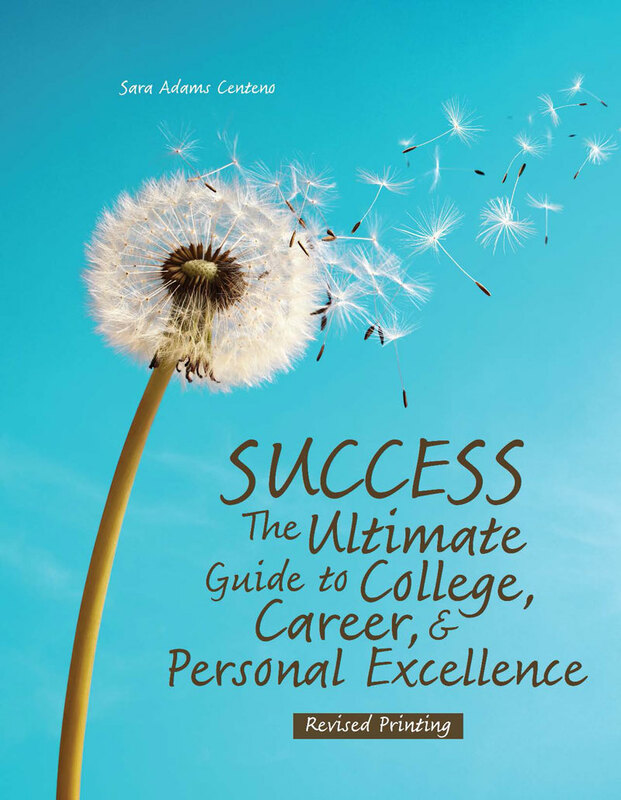 In 2016, she authored Success The Ultimate Guide to College, Career, and Personal Excellence to influence student motivation and increase retention of first year college students. This textbook provides research-based strategies for metacognitive skills, growth mindset, goal setting, time management, effective communication, personal accountability, stress management, cultural awareness, and emotional intelligence. In 2018, she authored her second textbook, The Science of Teaching and Learning: A Research-Based Framework for Excellence. This publication examines and applies educational and motivational theories to facilitate learning, influence behavioral change, and improve outcomes. From educational neuroscience to instructional methods and assessment, this textbook prepares readers with actionable strategies to teach with proficiency and expertise. Sara teaches Doctoral Colloquium, Educational Techniques, Principles of Contemporary Leadership, and Professional Communication and Consulting at Andrews University in Michigan. She purposefully and creatively infuses her online and face to face courses with student leadership development, emotional intelligence literacy, and technology. With 17 years of teaching experience in classrooms ranging from kindergarten to doctoral, her primary focus is improving the effectiveness of pedagogy and developing culturally responsive and engaging classroom environments and curricula. Sara is a founding partner of ProfTalk.org. She works to innovate higher education with keynotes, faculty development, and consulting services to colleges and universities. Sara is a member of the Society for Neuroscience and writes as a neuronline community leader, sparking global conversations about neuroscience in education.